I probably should have had an obit for Steve Jobs ready to run. We had a dry run when he resigned as head of Apple a few months ago. But I didn’t, and many others have accurately chronicled the facts, so instead, for my regular personal spirituality column, I’m going to look at a few things we can learn from him. Though I never had the pleasure of meeting the man, Steve Jobs’ work and influence affected my life often. At different times, I came close to working for both Apple and Pixar, the latter before he took it over. The first personal computer I ever bought was a Mac 512, no hard drive, for $2,600 (in 1984 money; that’s the equivalent of $5,400 today). Compared to my current MacBook, it had 1/800th the RAM, 1/600,000 the storage, and maybe 1/1000th the processing speed. The excitement as my wife and I brought home that machine and started exploring its revolutionary features was unlike anything I’ve experienced since with technology. Though iPods, iPhones and iPads are amazing, and the internet may be a more important shift, they are not as groundbreaking as was that moment. That was the arrival in my home of personal computing, of the home computer. All these later breakthroughs have built on that. Several years later, I was honored to write a landmark cover article for PC Magazine, at that time the nation’s tenth largest magazine, explaining the benefits of the Mac’s operating system to DOS and Windows users, and I wrote a column about the Mac for several years after that. For the past 33 years, I have looked in the mirror every morning and asked myself: ‘If today were the last day of my life, would I want to do what I am about to do today?’ And whenever the answer has been ‘No’ for too many days in a row, I know I need to change something. Remembering that I’ll be dead soon is the most important tool I’ve ever encountered to help me make the big choices in life. Because almost everything — all external expectations, all pride, all fear of embarrassment or failure — these things just fall away in the face of death, leaving only what is truly important. Remembering that you are going to die is the best way I know to avoid the trap of thinking you have something to lose. You are already naked. There is no reason not to follow your heart. Note that though this question reflects a soul so aware of death, Jobs tells us it was his guiding principle throughout his career, long before his first close call. Steve Jobs lived his passion. He had cranky moments, sure. And that passion sometimes came out as passionate pig-headedness. The consensus from personal friends who worked with him is that the experience was sometimes exhilarating but often infuriating. But ask yourself, would you rather be a passionate person who sometimes gets carried away, or a passionless person who never ruffles feathers. In Velvet Elvis, Rob Bell describes the sheer joy of playing on a trampoline — a moment in which he is entirely present and connected to the world around him through love, in which time stops and he feels the divine dimension of life. Jobs, in that commencement speech, observes, “Your work is going to fill a large part of your life, and the only way to be truly satisfied is to do what you believe is great work.” Great work also brings that timeless quality. Jobs is saying, why settle for devoting at least half your waking hours to something in which you don’t feel fully alive. I do want to say something about the fruits of Jobs’ work. Steve Jobs is certainly the most important inventor in our lifetime. But the defining quality in his inventions is that he saw technology as a tool for freedom, for empowerment, rather than for work productivity and increased profits. He often pointed to Stewart Brand and the Whole Earth Catalog as the thing from the previous generation that inspired him most. 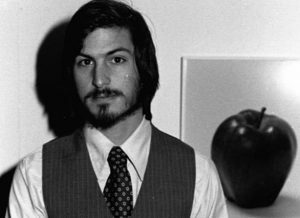 Jobs took 60’s liberation-oriented thinking about technology serving personal empowerment to another level. Steve Jobs was a radical. He had a subversive streak, and saw personal technology as something that could serve the subversive impulse rather than contain it. It’s important to understand that about him. And about Apple’s products. One of the reasons corporate IT departments refused to accept Macs into the fold until they we’re forced to by demanding users was that Jobs always prioritized freedom and collaboration above corporate control, so Apple products were more open and sometimes, honestly, less secure. This is also why Jobs always put user experience at the top of the priority list. Technology should not get in the way of the human. As much as possible, the technology should adapt to the way people naturally interact. So: pointing and clicking, dragging and dropping, icons that relate to real-world objects like trash cans and file folders. This also is at the root of Apple’s defining design characteristic: simplicity. In the design phase, Apple engineers, faced with decisions of whether to include a feature or controller, routinely choose to leave it out to avoid complicating the product and making it less easy and less fun to use. This contrasts sharply with most of the computer and consumer electronics world, where designs are jammed full of features and buttons that most users never understand and that create clumsy, ugly and less stable products. Apple products are elegant, and that elegance is thanks to Steve Jobs.